2002 AJ129 is an intermediate-sized near-Earth asteroid, somewhere between 0.3 miles (0.5 kilometers) and 0.75 miles (1.2 kilometers) across. It was discovered on Jan. 15, 2002, by the former NASA-sponsored Near Earth Asteroid Tracking project at the Maui Space Surveillance Site on Haleakala, Hawaii. The asteroid's velocity at the time of closest approach, 76,000 mph (34 kilometers per second), is higher than the majority of near-Earth objects during an Earth flyby. The high flyby velocity is a result of the asteroid's orbit, which approaches very close to the Sun—11 million miles (18 million kilometers). Although asteroid 2002 AJ129 is categorized as a Potentially Hazardous Asteroid (PHA), it does not pose an actual threat of colliding with our planet for the foreseeable future. 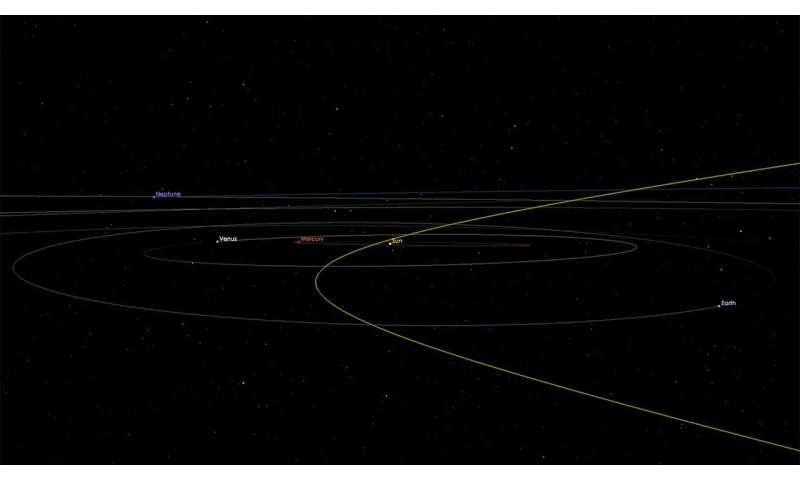 "We have been tracking this asteroid for over 14 years and know its orbit very accurately," said Paul Chodas, manager of NASA's Center for Near-Earth Object Studies at the Jet Propulsion Laboratory, Pasadena, California. "Our calculations indicate that asteroid 2002 AJ129 has no chance - zero - of colliding with Earth on Feb. 4 or any time over the next 100 years."